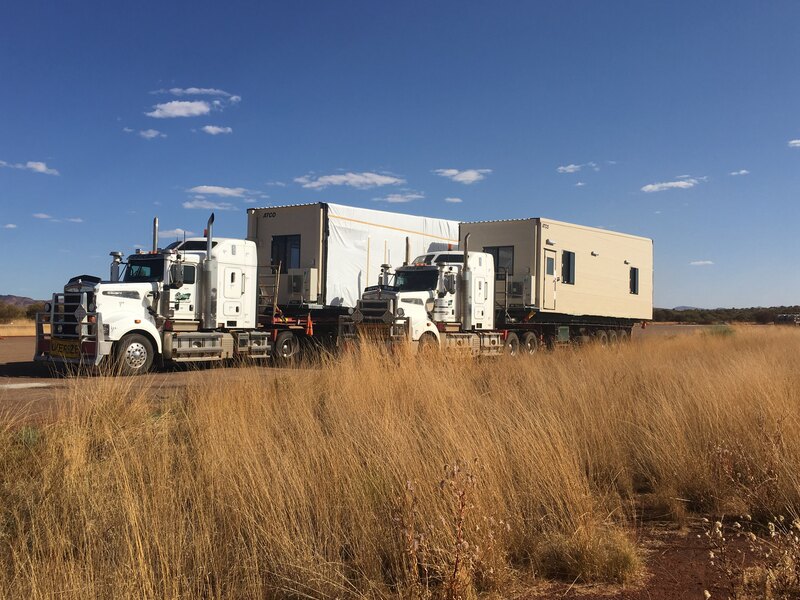 Sykes Transport are proud to have won the tender to transport 17 modular buildings for the BHP Mulla Mulla camp early works package in Western Australia’s remote Pilbara region. Decmil contracted Sykes Transport to move all 17 buildings from Perth to site over a four day period. Given the long distances and the single trailer oversize transport limitations, Sykes Transport’s extensive heavy haulage fleet was critical in ensuring project success. A large number of prime movers and trailing equipment was required to guarantee the timely delivery of all units. The buildings were manufactured to fit together on site so it was critical that they arrived on time and in the correct sequence. This was especially so given that Decmil were installing the units straight from the trucks without the use of a laydown area. Sykes Transport’s robust third party certified business management systems were important not only in ensuring compliance with strict BHP site rules and Main Roads WA permit applications, but also in facilitating well structured and organised project plans and client communications.